a world that is renewing itself -- all these things enter in. The Month of May is both named for and dedicated to Mary, the Mother of God, and October is dedicated to the Rosary. This page lists resources available on our web site for celebration and observance of feasts of the Virgin Mary; as well as prayers and favorite Marian devotions. It contains an alphabetical list of feasts and prayers, a chronological list of Marian feasts during the Church Year (also accessible from the Liturgical Calendar for the month in which a Marian feast occurs). There are also links to articles on this website and links to articles on the Adoremus website. Note: Permission is granted for individuals or parishes to copy material from this web site for personal or local group use only. Any other use (e.g., reprints in other publications) requires special permission. Blessed Mother Teresa's letter to Women for Faith and Family 1987 Conference -- Devotion to Our Lady. 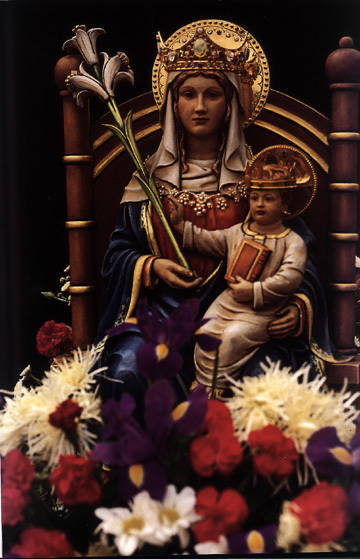 Mary Flowers - Flowers that traditionally symbolize Mary and her virtues and attributes. -The Month of Mary is May. -The Month of the Rosary is October. -Mother's Day is the Second Sunday of May. -The Feast of the Immaculate Heart is the Saturday following the Second Sunday after Pentecost. -The Saturdays are also dedicated to Marian Devotions. Wholly united with her Son . . .
967 By her complete adherence to the Father's will, to his Son's redemptive work, and to every prompting of the Holy Spirit, the Virgin Mary is the Church's model of faith and charity. Thus she is a "preeminent and . . . wholly unique member of the Church"; indeed, she is the "exemplary realization" (typus)508 of the Church. 972 After speaking of the Church, her origin, mission, and destiny, we can find no better way to conclude than by looking to Mary. In her we contemplate what the Church already is in her mystery on her own "pilgrimage of faith," and what she will be in the homeland at the end of her journey. There, "in the glory of the Most Holy and Undivided Trinity," "in the communion of all the saints,"516 the Church is awaited by the one she venerates as Mother of her Lord and as her own mother. 975 "We believe that the Holy Mother of God, the new Eve, Mother of the Church, continues in heaven to exercise her maternal role on behalf of the members of Christ" (Paul VI, CPG # 15). 500 LG 53; cf. St. Augustine, De virg. 6: PL 40,399. 501 Paul VI, Discourse, November 21,1964. 503 LG 58; cf. Jn 19:26-27. 506 LG 59; cf. Pius XII, Munificentissimus Deus (1950): DS 3903; cf. Rev 19:16. 513 Lk 1:48; Paul VI, MC 56. 515 Cf. Paul VI, MC 42; SC 103. 517 LG 68; Cf. 2 Pet 3 10. **Women for Faith & Family operates solely on your generous donations.